The 50 State Quarters spurred lots of nationwide interest. The program brought many exciting designs to our nation’s pockets and coin albums. However, there are certain state quarters that have brought about additional interest because of minor mistakes and errors on some of the designs. One of the 50 state quarters that gets the most attention is one with a special error that can be worth hundreds of dollars: the extra leaf 2004 Wisconsin quarter. How much attention did the extra leaf Wisconsin quarter really get? This USA Today article says a bit about how widespread the buzz became over this particular U.S. quarter. You see, the extra leaf Wisconsin quarter is considered one of the most important errors in the entire 50 State Quarters series. To see if you have a Wisconsin error quarter, you will want to turn your Wisconsin state quarter so that you are looking at the reverse (the back, or tails side). Do you see the corn stalk? Check out the left side of the corn stalk near the cheese wheel. 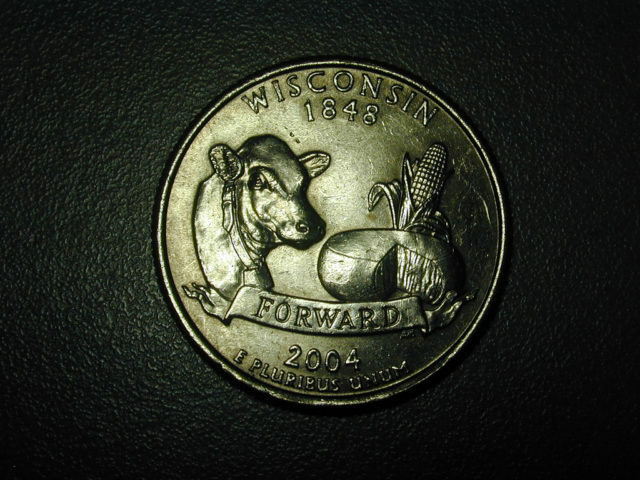 Extra leaf Wisconsin quarters have a leaf popping out of the left side of the corn stalk in the area immediately above the cheese wheel. Most Wisconsin quarters have no leaf that low on the left side of the stalk. There is no exact word on how the extra leaf actually got on the coin. However, it looks as though the extra leaf Wisconsin quarter came from an honest mistake. Still, there will always be speculation that the mistake was intentional. The story goes that a Denver mint operator turned off a machine processing blemished coins. He went to take a meal break and returned to find the machine was turning out thousands of blemished coins 90 minutes later. The blemished quarters were being mixed in with the regular quarters. The U.S. Mint estimates perhaps 50,000 of these extra leaf Wisconsin quarters may have been minted. Why did the Mint release these error quarters? Because the extra leaf Wisconsin quarters had already been processed and were waiting to be shipped off to circulation. It would have cost too much money to try and weed out the error quarters from the regular quarters. The high leaf variety has a slender leaf that appears to pop straight up next to the corn stalk and right out of the cheese wheel. The low leaf variety has what appears to be an arched leaf that links from the corn stalk down to the left, touching the wheel of cheese. What Is This Extra-Leaf Error Worth? The big question you’re probably asking is: How much is the extra leaf Wisconsin quarter error worth? I did a check on eBay for what the average going price was for these extra leaf errors. Most “Buy it Now” offers were listed for between $200 and $500 in uncirculated grades. Some listed even higher for better-quality uncirculated grades. Of course, these prices will most certainly fluctuate. Prices were much higher when the extra-leaf Wisconsin quarter had first made the news. Prices may stay where they are, sink, or rise based on collector interest and relative available quantity.